Unfairly neglected by many tourists visiting Africa, this former Portuguese colony, now known as the Republic of Mozambique, has a thriving tourist offer and many yet relatively unexplored and amazing sites. The country beckons with its vibe, culture, traditions, coastline and swaying palms, and most of all – its welcoming embrace. The scenic locations will dazzle even the most experience traveler, the rich marine life will fascinate the explorers and the bustling capital of Maputo will compete to the most famous Old Continent’s capitals. Words are not enough to describe how sublime Mozambique is, but in the lack of a more efficient “weapon” I will try to conjure its allure with nothing more than simple words. It is no secret that the most beautiful part of Mozambique is its coastline. You will instantly fall in love in the white sandy beaches and the azure-turquoise clear waters and wish to stay there forever. Exploring Mozambique will require visiting two of its most appealing tourist offers – Bazaruto Archipelago and Quirimbas Archipelago. Both with its own unique nature beauty and atmosphere, these archipelagos are luring tourists from around the globe to come and experience true spirit of African coast. Quirimbas consists of 32 islands, each of them with different personality. Some are inhabited with luxury villas and resorts, others with locals and their history and some even completely desert. The 250 miles of coastline offer different experiences – from humble backpacker resorts to the sophisticated intimacy of a private island. 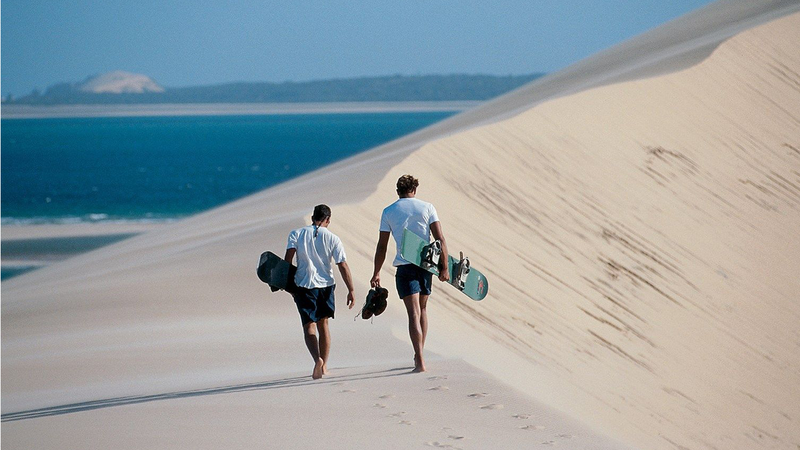 South of Quirimbas is the second heavenly location in Mozambique – Bazaruto. The group of five islands is home to some of the most staggering marine species and some of the best snorkeling, diving and surfing spots. The atmosphere varies depending on the island, and you can get everything from authentic African welcome to world-class high-end resort. Mozambique perhaps is not your typical African safari destination, but that is what makes it so special. Its Gorongosa National Park used to attract more visitors than South Africa and Zimbabwe combined. Though its popularity declined during the civil war (1977-1992), today it is finally regaining its strength, so it is a fascinating place to visit, if you are planning a trip to Mozambique. Do not underestimate Mozambique’s ability to get your adrenaline pumping. Besides exploring the rich marine life and surfing, there are amazing offers of paragliding, horse riding, sand-boarding, quad biking, sea kayaking and other sports and water sports. One of the most extraordinary capitals of Africa, Maputo is enchanting with its diversity in every sense. There is so much to see in this city that you will definitely need some time to absorb everything. So, staying several days would be a good thing to do. Hotels in Maputo can be either overcrowded or expensive, but you can find a trustworthy middleman agencies such as Property Maputo, and rent a house or an apartment. Explore Maputo in stages – one can be its architecture (colonial style buildings vs. Marxist-style blocks), other its people (the people are actually the greatest quality of Mozambique, they are friendly, outgoing and willing to help a complete foreigner), etc. Maputo’s dining scene is a special story of a love affair between Portuguese cuisine and the distinctive local spices. The Pearl of Indian Ocean, as this city is also called, is home to some of the finest restaurants in the region, offering world-class sea food and delicious bouquet wines inspired by the most famous Portuguese wines. To conclude, if you ever find yourself in the “Terra de Boa Gente”, as Vasco de Gama called Mozambique, you will be thrilled with all the magnificent things it has to offer. Truly, this land is the proof that Mother Nature is the most talented artist out there. The sites you see in Mozambique will stay forever engraved in your mind and it will be the most wonderful memories.